1. Glee has gone downhill. Tonight's Christmas special...whew. 2. I just ordered some art! From art.com, where else. 3. I heard a rumor there is a 10-day super cold going around. 4. I found two more ninja rubber ducks today! Last weekend, the Sherpa hid a bunch of ninja rubber duckies all around the house while I was out practicing my new sport. He did not warn me and the sneaky ninjas started launching their stealth attack on me. Next to my shampoo in the shower, buried in my underwear drawer, beside the K-cup's in the coffee drawer, chillin' in the refrigerator, and hiding deep in my SHOE!!! 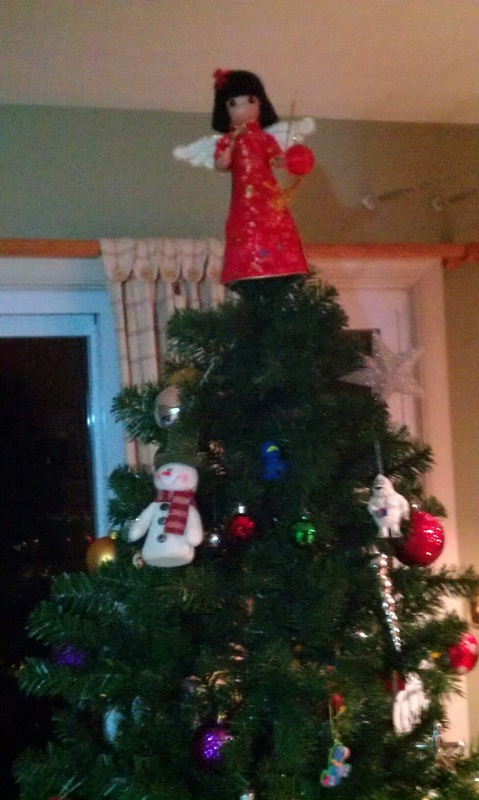 The most hilarious part is that the Chinese Christmas angel tree topper I ordered had come in. I was pretty excited, because it's our first Christmas living together. 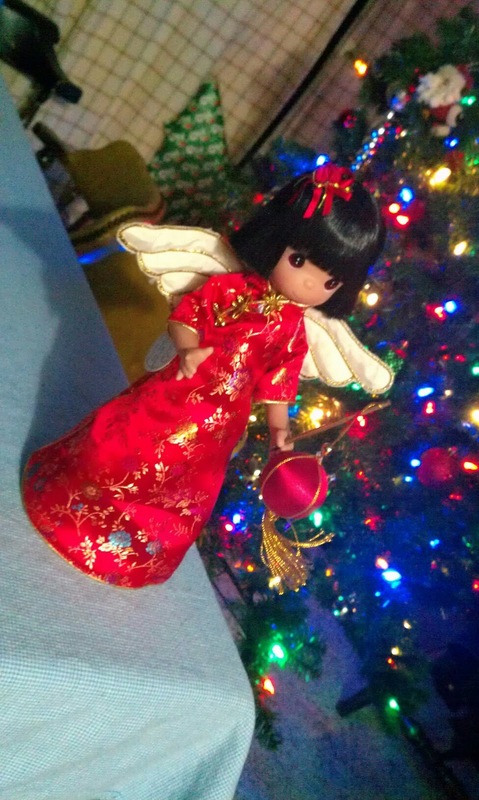 We just had an ugly sparkly silver star, but I wanted an angel, and it was NOT going to be some blonde-haired blue-eyed white girl angel. Not in this household! Isn't she adorable?? I got her from this website that Google magically found for me when I googled "Chinese Christmas angel": www.mandysmoon.com. They even have Korean and Vietnamese ones! Ok that part wasn't the hilarious part yet. 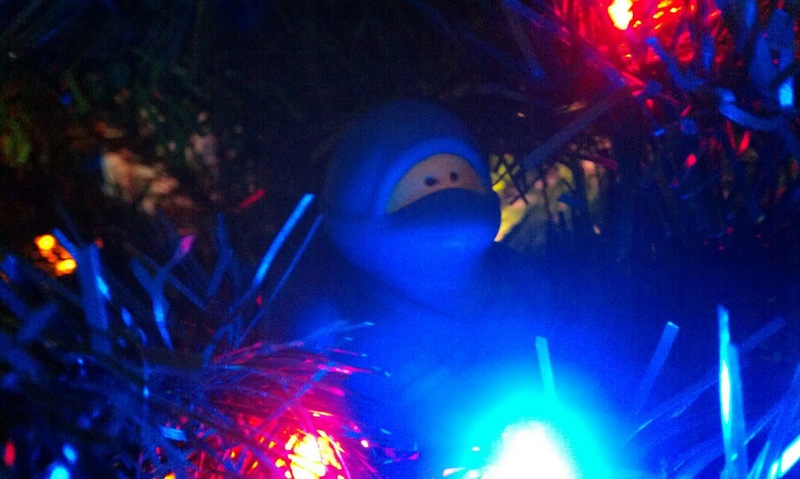 The hilarious part is that I put the angel up over the weekend and the ninja duck was staring right at me. 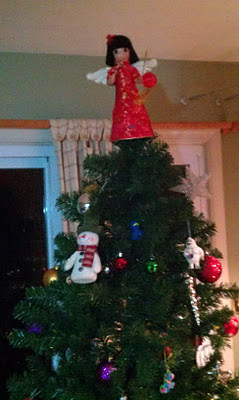 I didn't notice him there until just now, when I went to take a picture of the tree with the angel on top. Can you see him masquerading as a Christmas ornament? Crazy ninja rubber duckies!